The 120 and 121 802.11n indoor access points are designed for maximum deployment flexibility in low-density environments that require above-ceiling or enclosure-based installations. 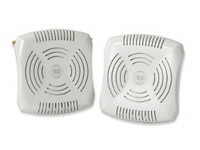 The multifunction AP-120 and AP-121 are indoor 802.11n access points (APs) designed for maximum deployment flexibility in low-density environments that require above-ceiling or enclosure-based installations. These high-speed APs deliver wire-like performance at date rates up to 300 Mbps. 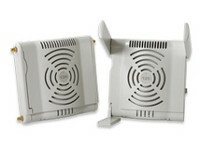 The AP-120 features a single 3×3 MIMO dual-band 2.4-GHz/5GHz radio with detachable antenna interfaces while the AP-121 features the same radio with integrated antenna elements. Both APs are built to provide years of trouble-free operation and are backed by a limited lifetime warranty. Working with Aruba’s line of centralized Mobility Controllers, the AP-120 and AP-121 deliver secure, high-speed network services that move users to a “wireless where possible, wired where necessary” network access model. The network can then be rightsized by eliminating unused Ethernet switch ports and thereby reducing operating costs. The multifunction AP-120 and AP-121 can be configured through the Mobility Controller to provide WLAN access with part-time air monitoring, dedicated air monitoring for wireless IPS and spectrum analysis, Remote AP (RAP) functionality or secure enterprise mesh. The AP-120 and AP-121 feature dual 100/1000BASE-T Ethernet interfaces and operate from standard 802.3af power-over-Ethernet (PoE) sources. • 802.11n indoor AP designed for maximum deployment flexibility in low-density environments that require above-ceiling or enclosurebased installations. • Spectrum analysis* remotely scans the 2.4-GHz and 5-GHz radio bands to provide increased visibility into non-802.11n RF interference sources and their effect on 802.11n channel quality. 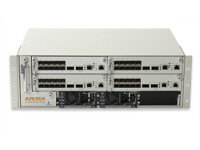 please see your Aruba representative. 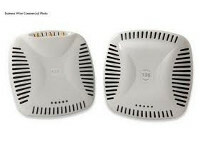 AP-120-MNT-CV Cabling cover mounting kit to to facilitate tamper – proof mounting of an Aruba AP-121 or AP-125 access point.